Václav Kučera Memorial Concerts Continue—Sunday April 29, @ 7:30 PM, 2018 at the Wonderful 1867 Sanctuary in Ewing NJ! Classical Guitarist Stanley Alexandrowicz returns to the 1867 Sanctuary on Sunday April 29, @ 7:30 PM, 2018 for a program of Virtuoso Romantic Showpieces by Napoleon Coste and Ivan Padovec, and Contemporary Masterpieces by Václav Kučera, Prof. Kendall Kennison, and Maestro Robert W. Butts! As a special tribute, we will pay homage to the late Czech composer (and friend of tonight’s Artist) Maestro Václav Kučera (1929-2017), with works by composer colleagues and friends! Featured will be Professor Kendall Kennison’s Guitar Sonata and Backanally, the NJ Premiere of Maestro Robert W. Butts’ Tombeau—In Memoriam Václav Kučera, and we will conclude with our “centerpiece work” the profoundly moving Diario—Omaggio a Che Guevara by Vaclav Kucera himself! Also, back by popular demand, will be the world famous “Early Morning Suite” (for solo guitar) by Baroque Orchestra of New Jersey composer and conductor Maestro Robert W. Butts! (dedicated to tonight’s Artist). Václav Kučera (1929 – 2017, Prague) was one of the great composers of the 20th century. His works encompass all genres—orchestral, stage, vocal, chamber, electronic—but those involving the guitar (an instrument he has a special kinship with) hold a unique place within his oeuvre. He has chosen this medium to express some of his most profound and poetic visions. Václav Kučera studied composition at the Moscow Conservatoire (under Vissarion), and simultaneously graduated with a specialization musicological studies. He worked in the Czechoslovak Radio, headed the Cabinet of Contemporary Musical Studies affiliated to the Union of Czechoslovak Composers, and was active at the Institute of Musical Science in the Czechoslovak Academy of Sciences. From 1969 to 1983, he functioned as lead secretary of the Union of Czech Composers and Concert Artists. Since 1972 he has been Professor of Composition at the Prague Academy of Music and Dramatic Arts (and later was Docent in the subject of modern compositional trends). In 1979 he was awarded the state distinction “For Outstanding Work”, and in 1986 honored with the title Merited Artist—one of the most prestigious awards granted in the Czech Republic. As a composer, Kučera began from an admiration for Janacek, Stravinsky and Prokofiev, and, integrating the character of Czech and Moravian melodiousness, achieved a uniquely personal musical idiom. His artistic ‘voice’ has the character of an individually tinged expressiveness that features the utilization of new musically-technical means to express socially-important and artistically inspired arguments of the present time. The compositions of Kučera have won numerous distinctions: the Tableau for Piano and Orchestra – the prize of Queen Maria-Jose (Geneva 1970); Lidice – special recognition of the Czechoslovak Radio for the 25th anniversary of Czechoslovakia s liberation (1970), as well as the prize of the Italian Radio Prix d’Italia (1972). The cycle Celebration of Spring – the first prize in the competition of the Central Council of the Trades-Unions (1977), and the string quartet Consciousness of Continuities – the prize of the Union of Czechoslovak Composers and Concert Artists (1983). 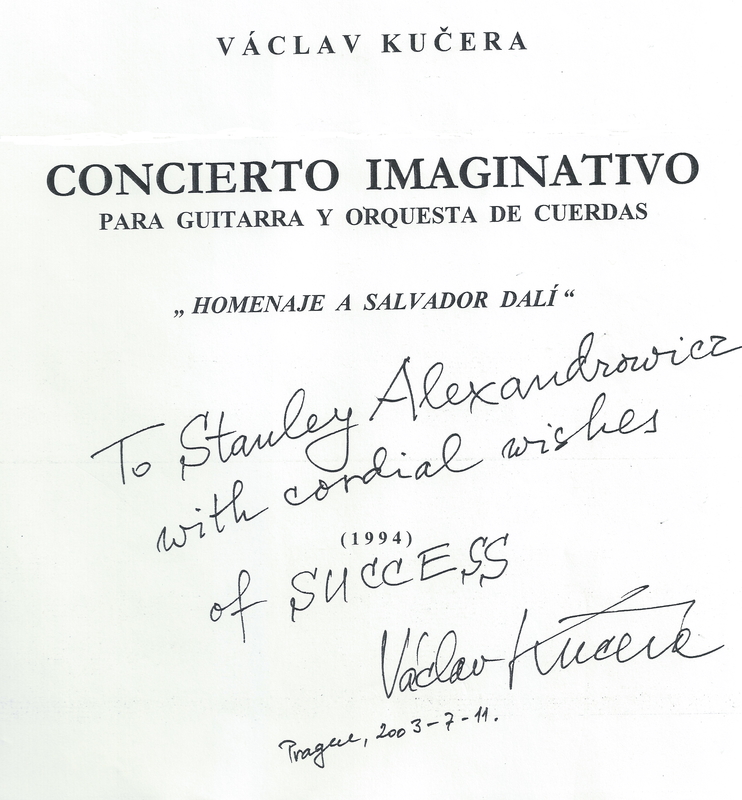 Tonight’s Artist Stanley Alexandrowicz, gave the U.S. premiere of Vácav Kučera’s Concierto Imaginativo-Homenaje a Salvador Dali for guitar and string orchestra (Baltimore) in honor of the composer’s 80th birthday year. Politics aside, the Diario—Omaggio a Che Guevara is Václav Kučera’s poetic and deeply moving vision of “the Fallen Hero’s Journey” presented through his genius as a “concert cycle” unique and unparalleled in the literature of Contemporary classical guitar. Celebrating Romantic 19th Century Virtuoso Composer-Guitarists & American Master Composers! 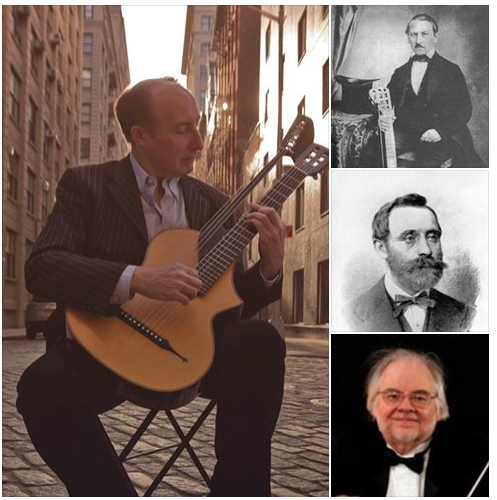 Dear Friends and Colleagues, I will be performing soon in New Jersey (6 July, 2017 @ 8:00 pm) a recital devoted to 19th Century Romantic Virtuoso Guitar Composers – Luigi Legnani, Napoleon Coste, J.K. Mertz, Johann Dubez, and to Contemporary American Masters – Ernst Bacon, Brian Fennelly, Kendall Kennison, and Maestro Robert W. Butts! Kendall and Robert will be in attendance to introduce and speak about their compositions (“Sonata No. 1 for Solo Guitar,” and “Early Morning Suite respectively”). The recital will take place in the “sonically magnificent” 1867 Sanctuary in Ewing New Jersey! 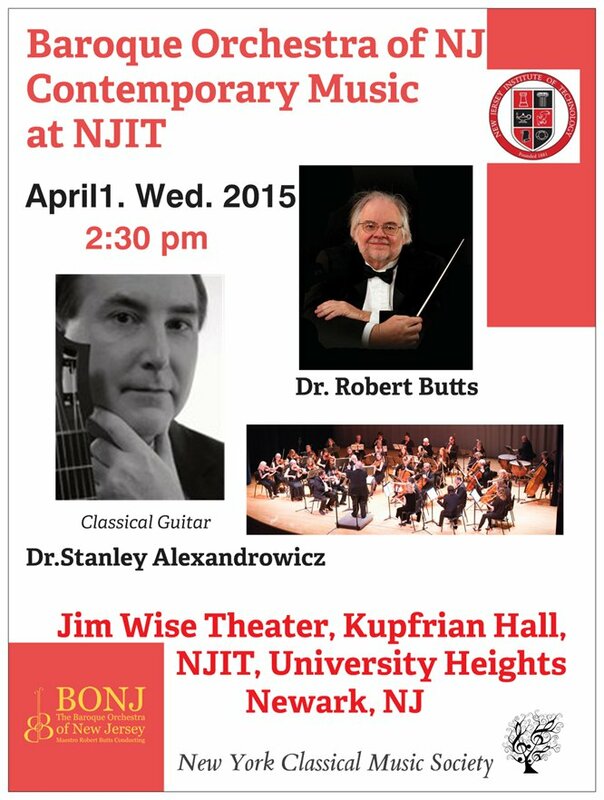 Celebrating the Guitar Music of Václav Kučera this Spring with Maestro Robert Butts and the BONJ! Vácav Kučera (b. 29 April, 1929 in Prague) is one of the great composers of the 20th century. His works encompass all genres—orchestral, stage, vocal, chamber, electronic—but those involving the guitar (an instrument he has a special kinship with) hold a unique place within his oeuvre. He has chosen this medium to express some of his most profound and poetic visions. We pay homage to Maestro Kucera through these concert featuring his “Concierto Imaginativo—Homenaje a Salvador Dalí” and, his “Diario—Omaggio a Che Guevara” (for solo guitar). Vácav Kučera studied composition at the Moscow Conservatoire (under Vissarion), and simultaneously graduated with a specialization musicological studies. He worked in the Czechoslovak Radio, headed the Cabinet of Contemporary Musical Studies affiliated to the Union of Czechoslovak Composers, and was active at the Institute of Musical Science in the Czechoslovak Academy of Sciences. From 1969 to 1983, he functioned as lead secretary of the Union of Czech Composers and Concert Artists. Since 1972 he has been Professor of Composition at the Prague Academy of Music and Dramatic Arts (at present he is Docent in the subject of modern compositional trends). In 1979 he was awarded the state distinction “For Outstanding Work”, and in 1986 honored with the title Merited Artist—one of the most prestigious awards granted in the Czech Republic. As a composer, Kučera began from an admiration for Janacek, Stravinsky and Prokofiev, and, integrating the character of Czech and Moravian melodiousness, achieved a uniquely personal musical idiom. His artistic ‘voice’ has the character of an individually tinged expressiveness that features the utilization of new musically-technical means to express socially-important and artistically inspired arguments of the present time. The compositions of Kučera have won numerous distinctions: the Tableau for Piano and Orchestra – the prize of Queen Maria-Jose (Geneva 1970); Lidice – special recognition of the Czechoslovak Radio for the 25th anniversary of Czechoslovakia s liberation (1970), as well as the prize of the Italian Radio Prix d’Italia (1972). The cycle Celebration of Spring – the first prize in the competition of the Central Council of the Trades-Unions (1977), and the string quartet Consciousness of Continuities – the prize of the Union of Czechoslovak Composers and Concert Artists (1983). 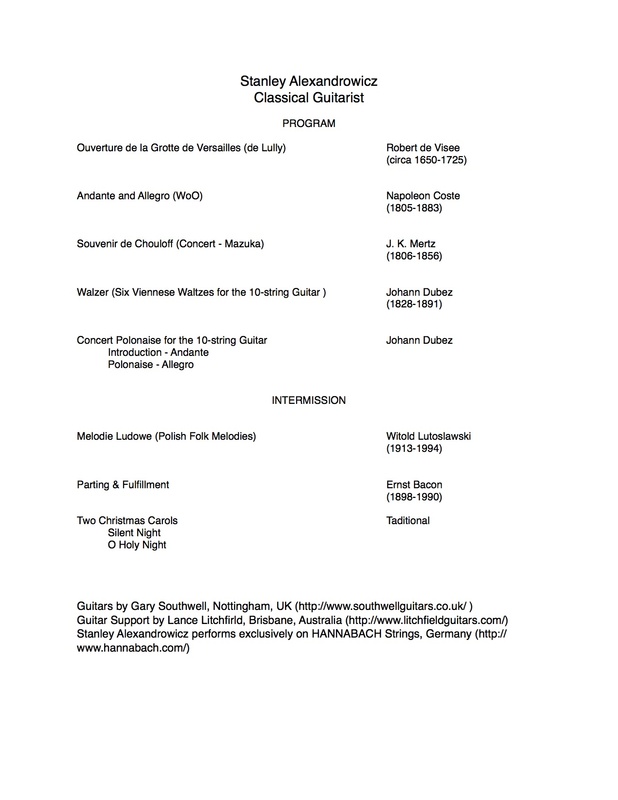 Compositions of the 19th century’s greatest composer-guitarists Napoleon Coste, J. K. Mertz and Johann Dubez, on an 1861-design, 10-string Viennese guitar, and on the modern classical guitar, Contemporary pieces including Ernst Bacon’s “Parting & Fulfillment,” Brian Fennelly’s “Maverick Tango,” Vaclav Kucera’s dramatic concert-cycle “Diario―Omaggio a Che Guevara,” and Eric Sessler’s Guitar-Fantasy “Bombadiliana” based on Tolkien. April in Italy and England – “In Recital” with DOMINIKA ZAMARA and Vaclav Kucera! 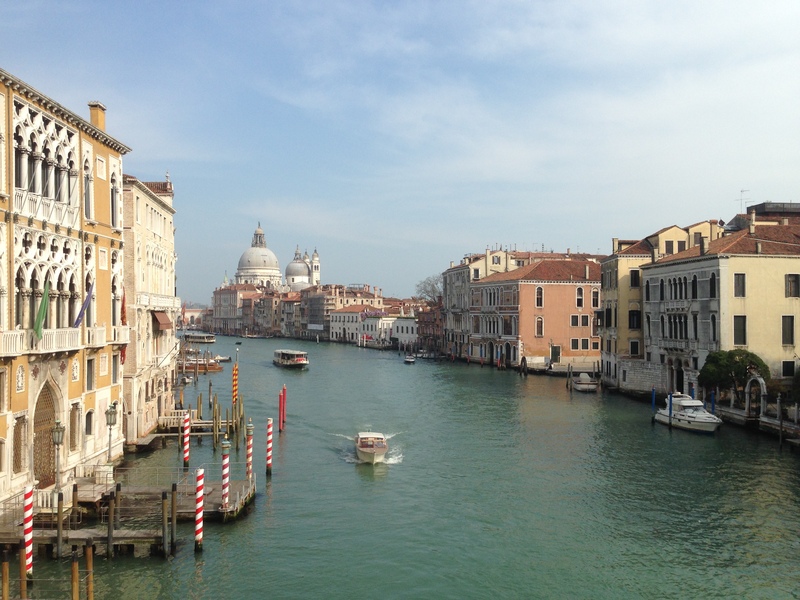 March and April proved a fantastic time for music making in both Italy and England! Starting in the UK with a London solo recital (“The Virtuoso Guitar – 10 and 6 String Guitars”), and proceeding next to the University of Surrey for a lecture-recital to inaugurate the opening of the International Guitar Research Centre (“The Evolution of the Romantic Multi-string Guitar”), England proved to be “the land with MUCH music, and GREAT musical company!” My “companions” therein were the renowned guitar historian and scholar Allan Clive Jones (and his lovely wife Karen); the “Colossus of the Keyboard” British pianist Jonathan Powell; and perhaps the finest luthier alive today, the great Gary Southwell (who built my two fantastic guitars—with a third “Bog Oak” guitar in the works!). I proceeded next to lovely Venice to begin my Italian tour with the possessor of certainly one of the LOVELIEST voices in the world today, the Great ARTIST, and my “Voice & Guitar” duo-partner, the internationally acclaimed soprano Dominika Zamara. Beginning with concerts in Padova and Vicenza, and on next to radio and television interview-recitals (broadcast throughout Italy, Switzerland, and Spain), our august company included famed actor, television host, and “raconteur extraordinaire” Gianluca Mancuso; renowned visual and graphic artist and music production “genius” Luigi Mosello (EDIT MUSIC ITALY), and host-moderator “extraordinaire” (of the Starbit Studios “Celebrity Magazine”) the phenomenal Tino Bisagni! Upcoming in Summer and Fall, duo (and solo) concerts for Dominika Zamara and myself include Taiwan, California, NYC, Mexico, the Bahamas, Europe, Seoul, etc. Troubadours and Trios! Upcoming Concerts In February! On 17 February, I have the great honor to perform on “The Troubadour Series” at Wofford College, South Carolina! It is named after Carl Sandburg, who was called “the Old Troubadour” by Frank Lloyd Wright. Sandburg’s home is located in Flat Rock, N.C., and he visited the Wofford campus on more than one occasion. He was an avid guitarist who wrote several poems inspired by the guitar and guitarists. The program will feature both 19th Century Romantic guitar music and Contemporary works. 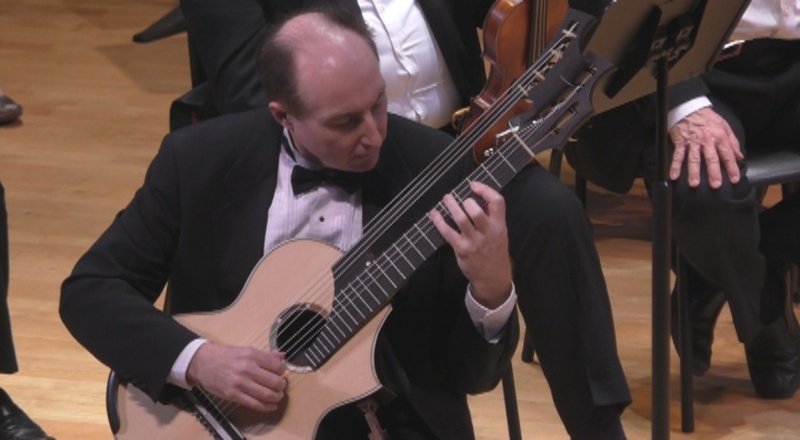 The music of guitarist-composers Napoleon Coste, J.K. Mertz, and Johann Dubez, (each the greatest virtuoso of his country), will be performed on an 1861 Scherzer-design, 10-string “period guitar.” The contemporary portion of the program (played on the modern guitar) features music by American composers Ernst Bacon and Brian Fennelly, and, as a “centerpiece” the profoundly moving “Diario—Omaggio a Che Guevara” by Czech composer Vaclav Kucera. 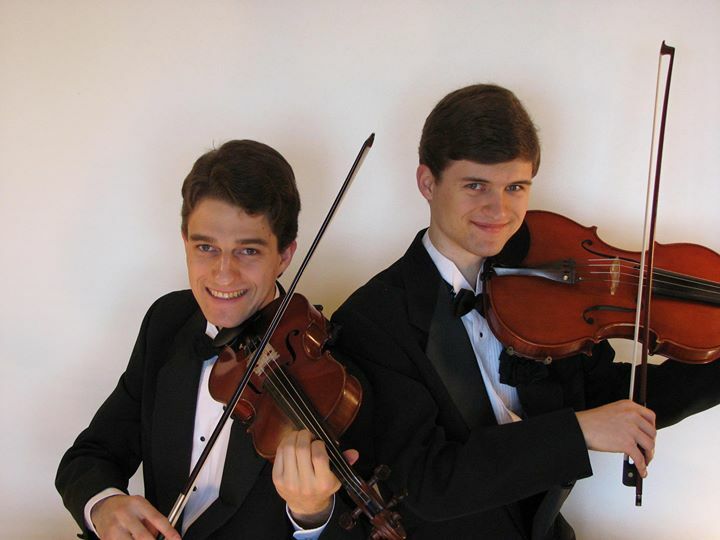 In the concerts “TRIOS for Guitar and Strings” I join the fantastic “Classic Strings Duo” of brothers Kevin (violin) and Bryan Matheson in works of Beethoven, Villa-Lobos, Paganini, Ibert, and others in evenings of chamber music sure to delight! A Polish Christmas Celebration and Concerts in Italy with World-renowned soprano Dominika Zamara in January! 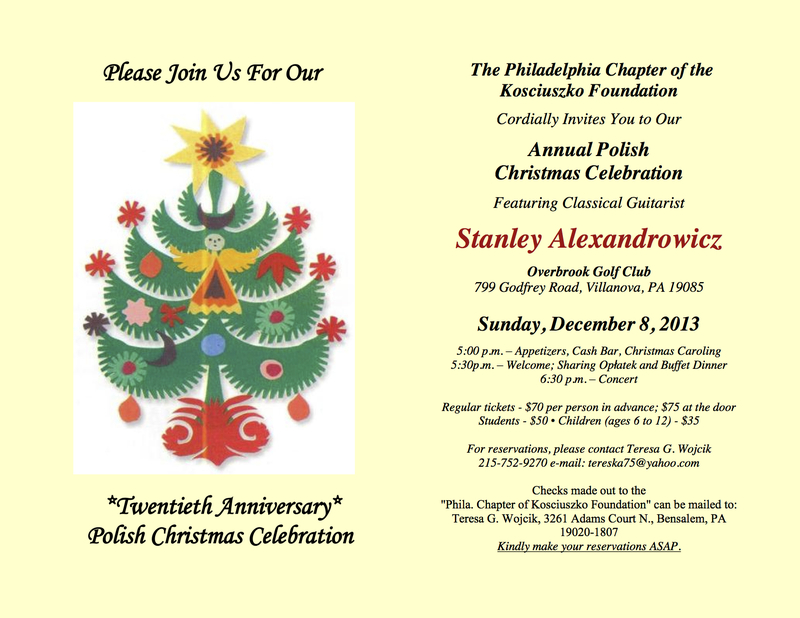 On Sunday, December 8, 2013, the Philadelphia Chapter of the Kosciuszko Foundation will present its “Annual Polish Christmas Celebration” where I will be featured in a recital of Polish (and Polish-related) guitar music. Included are the “Melodie Ludowe” of Witold Lutoslawski (this is his Centenary); works by American composer Ernst Bacon, and 19th Century Romantic works by composer-virtuosi Napoleon Coste, J. K. Mertz, and (the transcendental) Johann Dubez—the latter group played on the 10-string, 1861-design, Viennese Scherzer guitar. January begins with concerts in Italy with the World-renowned soprano Dominika Zamara! I will be featured Guitar Soloist in Marco Fedalto’s new Masterpiece “L’opera La Serva di Padova” on 3 January at the beautiful “Teatro Verdi” in Padova; and “Voice & Guitar” duo-recitals in Treviso, Milano, etc., starting January 5th! October US Concert Tour with World-renowned soprano Dominika Zamara! This October, world-renowned soprano Dominika Zamara returns for our concerts in New York, Philadelphia, Washington D.C., New Jersey, etc. After a “standing ovation” performance this past September at Lincoln Center (NYC), and recent operatic and concert performances throughout Italy, Dominika will be featured in “Arias, Songs, and Solos for Voice and Guitar” — The program consists of operatic arias from the works of Vincenzo Bellini, Antonín Dvořák, Giacomo Puccini, G.B. Pergolesi; songs of W.A. Mozart, Sergei Rachmaninov, William Walton, Ivan Padovec, and Georges Migot; and works for solo guitar by Ernst Bacon, Vaclav Kucera, and Dora Pejacevic. The internationally-renowned “Voice and Guitar Duo” of Dominika Zamara (Soprano) and Stanley Alexandrowicz (Classical Guitar) bring together the worlds of Opera, Lieder, Song, and Contemporary Music, in realizations of unmatched sonic beauty and rarified musical intelligence. One of the finest singers before the public today, Dominika Zamara is equally adroit in the spheres of Grand Opera, 19th Century Lieder, Sacred Music, and Contemporary Works. Hailing originally from Poland, and now based in Venice, she has sung throughout Europe to unanimous acclaim—virtually wherever she appears—Paris, London, Vienna, Madrid, Prague, etc., and throughout all of Italy. 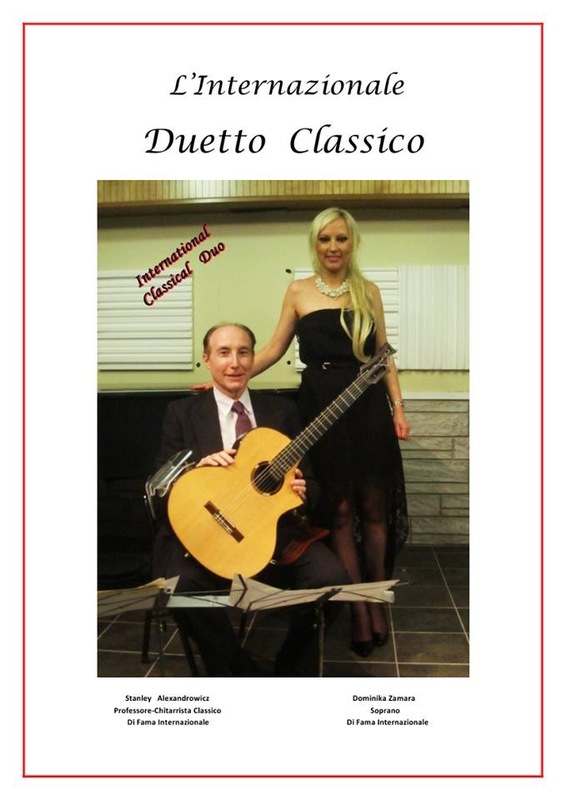 The ”Voice and Guitar Duo” of Zamara and Alexandrowicz presents in recital, music ranging from Renaissance lute songs and Baroque arias, to the high drama of “Verismo” and Contemporary Works written specifically for their unique talents. Touring throughout the United States, and soon to be performing in Europe and Asia, they are featured on the forthcoming EDIT MUSIC ITALY CD of Dominika Zamara. Tickets are $16 in advance, $20 ($18 for WAC members, $10 for students) at the door.